RW-1~0.JPGArrivalArty caps and shirts cover the landscape in front of Allin Hall as we gather for the first day of Agenda events as organized and arranged by Host Jerry Orr. Photo courtesy of Joe Henderson. RW-2~0.JPGFire Drill: roof of Allin HallAs we gathered for our first morning activity, the Ft Sill Fire Department gave us a daring sight. A ladder was extended from the fire truck below to the very top of Allin Hall, our Quarters. Then, some brave soul climbed that ladder and got a great view of the Fort and surrounding areas. Allin_Hall_3.JPGArrivalTelling war stories in the Lobby. Geary Burrows seems to have the floor. Terry Stuber at right, Bob Bowden on chair, J William Ward at right. Allin_Hall_4.JPGArrivalOur ladies relax in the Lobby awaiting the next event. Allin_Hall_5.JPGArrivalDavid and Marie Scott outside Allin Hall. Allin_Hall_2.jpgArrivalA sea of red 2/9th FA shirts outside Allin Hall. Mike Kurtgis and Jerry Orr seem to be wondering, "Who the hell made this coffee??" 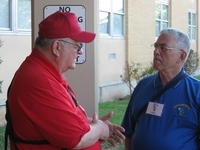 Allin_Hall.jpgArrivalRedleg Doug Turner makes a point with Bill Henson, the Immediate Past President of the 35th Infantry Regiment Assn. We were honored to have him join us for our Encore Reunion. MK-11.JPGArrivalMike Kurtgis, John Cashin, and Carlton Epps all served together in Nam. Like a 50-year old reunion! 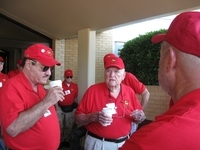 Joe_H-17.JPGArrivalJoe Henderson, Bill Henson, Past President of the 35th Regt Assn, and Jim Connolly. Joe_H-1.JPGFirst Event - Ted's Cafe, LawtonThe Mighty Ninth Webmaster and co-organizer of the Encore Reunion, Dennis Dauphin, sets up the PowerPoint slide show. We viewed over 240 slides/photos our our "younger days" in Vietnam. Joe_H-2.JPGFirst Event - Ted's Cafe, LawtonJoe (in neon yellow shirt) and Sandy Turner next to Ernie Correia, who is wearing his "official" 2/9th shirt.